I have added two new art prints to my Etsy shop. 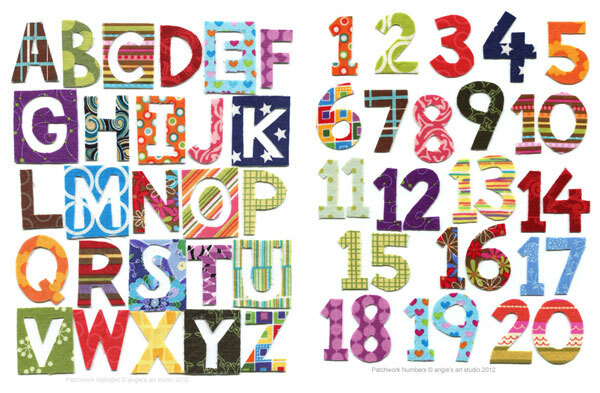 Patchwork Alphabet and Numbers are a bright and colorful collage of fabric letters and numbers that are a visual feast for young and old! I think they look great as individual prints, but as a pair, they match up really well and look twice as great! Would go really well in the kid’s play room. Now, also available as instant digital download printables! You won’t receive a physical item when buying a printable, instead you download the high resolution (300dpi) digital files which you then print at home or take to a print shop (such as Staples or Kinkos) or upload online (such as Shutterfly.com). Printables also allow you to resize the pictures to suit the frame or wall you have in mind and you can print as many as you like for yourself or give them as gifts. Okay, okay, so I did say that 2012 was going to be the year I do more painting and this is technically not a painting, but the creative process was very similar in terms of positioning and re-positioning colors and considering the positive and negative shapes. 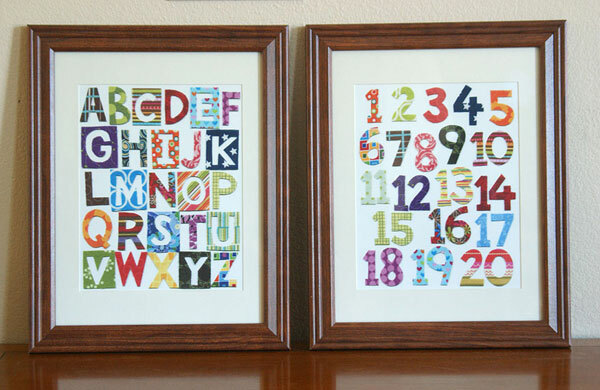 I used 26 different designs of fabric, one for each letter of the alphabet, and 20 different fabric designs for numbers 1 to 20. It took me a whole weekend to finally settle on the patchwork alphabet pictured here as I made 2 other versions with different fabric combinations. One of the other versions was set against some onasburg cotton (you can see a part of it in the picture below) as I thought the textured background would be more interesting. As it turned out, it did look more interesting and also too busy. The letters were harder to distinguish and for a baby trying the learn the alphabet, I thought it would be better to go with the white background. 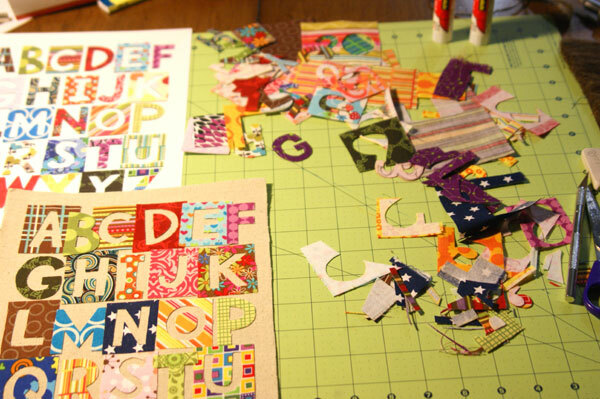 The aftermath of my weekend of cutting out letters and numbers out of bits of fabric and the other 2 versions of my patchwork alphabet. « « Previous: It’s Raining Cats and Dogs!